On the beach in the resort of Kolymbia, 32 km from Rhodes town and 300m to resort centre with cafes, bars and restaurants. 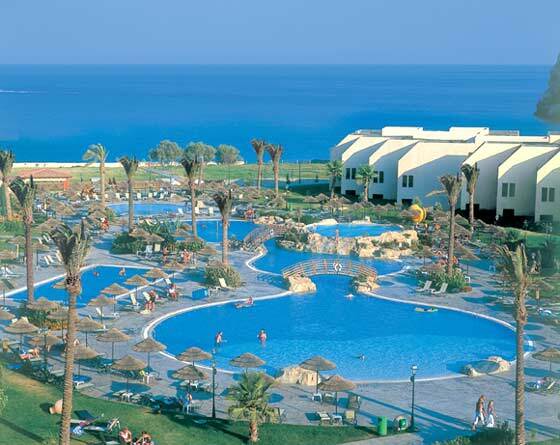 With its club-style facilities and organised activities, the hotel is ideal for fun seekers of all ages. Lagoon-shaped swimming pool, open-air Jacuzzi, games pool, separate childrens pool, multi-purpose sports courts (basketball, volleyball, tennis, mini-football), beach volley, gym, table tennis, archery, darts, billiards, water sports, childrens clubs, childrens playroom and playground, full range of organized daytime activities and international evening entertainment. At Atlantica Aegean Blue, at any time of the day you can join in one of the organised day-time activities or enjoy the evening entertainment provided by our in-house animation team . Non-smoking, buffet-style restaurant, themed evening meals, A la Carte restaurant, pool-side taverna, pool bar, lounge cocktail bar, childrens buffet, early suppers, All Inclusive terms. Serving buffet breakfast and dinner (with show-cooking, local corner, low calorie and healthy section). For this extra 'exotic' touch to your All Inclusive holiday. Serving daily lunch with a variety of fresh salads, Greek and international 'A la minute' dishes, and occasionally themed dinner, the place will certainly let you get the local taste of the Island. Open all day long till early morning hours, offering refreshments, sweets and cold snacks, it is a nice and cool retreat from the summer heat of the busy outdoor areas. Είστε ιδιοκτήτης ή διευθυντής στο CLUB ATLANTICA AEGEAN BLUE; Εγγραφείτε τώρα για δωρεάν εργαλεία, που μπορείτε να χρησιμοποιήσετε για να βελτιώσετε την καταχώρησή σας και να συνδέσετε την ιστοσελίδα σας και το σύστημα κρατήσεών σας.